This article follows up on the series devoted to k-means clustering at The Data Science Lab. Previous posts have dealt with how to implement Lloyd’s algorithm for clustering in python, described an improved initialization algorithm for proper seeding of the initial clusters, k-means++, and introduced the gap statistic as a method of finding the optimal K for k-means clustering. Although the gap statistic, based on a paper by Tibshirani et al was shown to find optimal values for the number of clusters in a variety of cases when the clusters where globular and mildly disjointed, its performance might be hampered by the need of perfoming Monte Carlo simulations to estimate the reference datasets. A reader of this blog, Jonathan Stray, pointed out a potentially superior method for selecting the K in k-means clustering, so let us implement it and compare. The approach suggested by our reader is based on a publication by Pham, Dimov and Nguyen from 2004. The article is very much worth reading, as it includes an explanation of the drawbacks of the standard k-means algorithm as well as a comprehensive survey on different methods that have been proposed for selecting an optimal number of clusters. A data set with objects could be grouped into any number of clusters between 1 and , which would correspond to the lowest and the highest levels of detail respectively. By specifying different values, it is possible to assess the results of grouping objects into various numbers of clusters. From this evaluation, more than one value could be recommended to users, but the ﬁnal selection is made by them. is the number of dimensions (attributes) of the data set and is a weight factor. With this definition, is the ratio of the real distortion to the estimated distortion and decreases when there are areas of concentration in the data distribution. Values of that yield small can be regarded as giving well-deﬁned clusters. Note the recursive definition of (variable a in the code snapshot above) and the fact that the computation of for requires knowing the value of , which is passed as input parameter to the function. For a first experiment comparing the Pham et al. and the gap statistic approaches, we create a data set comprising 300 points around 2 Gaussian-distributed clusters. We run both methods to select spanning the values . (The function run from class DetK takes a value as input and checks all values such that .) 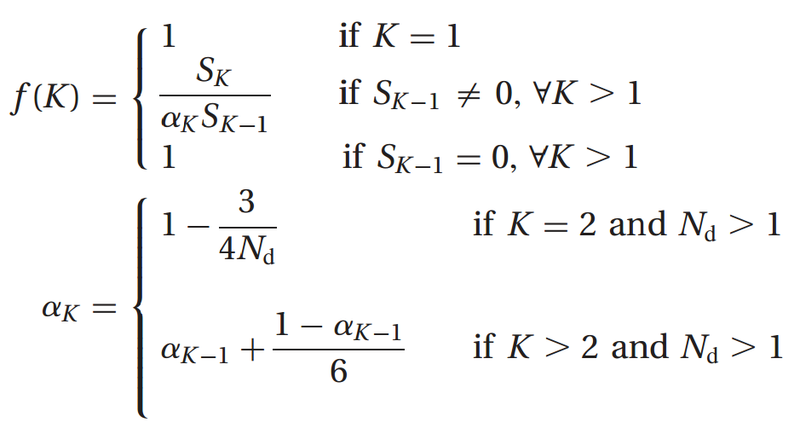 Note that every run of the k-means clustering algorithm for different values of is preceded by the k-means++ initialization algorithm, to prevent landing at suboptimal clustering solutions. According to Pham et al. lower values of , and especially values are an indication of cluster-like features in the data at that particular . In the case of , the global minimum of in the central plot leaves no doubt that this is the right value to choose for this particular data configuration. The gap statistic, depicted in the plot on the right, yields the same result of . Remember that the optimal with the gap statistic is the smallest value for which the gap quantity becomes positive. Similarly, we can analyze a data set consisting of 100 points around a single cluster. The results are shown in the plots below. We observe how the function does not show any prominent valley or value for which for any of the surveyed s. According to the Pham et al. paper, this is an indication of no clustering, as is the case. The gap statistic agrees that there is no more than one cluster in this case. For the data distribution on the top, one can see that the 4 clusters are positioned in such a way that they could also be interpreted as 2 clusters made of 2 subclusters each. The detects this configuration and suggests 2 possible values of , with a slight preference for over . The gap statistic changes sign at , albeit barely, and it does it again and more clearly at . In both cases, a strict application of the rules prescribed to select the correct does lead to a rather suboptimal, or at least dubious, choice. In the bottom plot however, the 4 clusters are somehow more evenly spreaded and both algorithms succeed at identifying . The method still shows a relative minimum at , indicating a potentially alternative clustering. In this particular example, the method is more than one order of magnitude more performant than the gap statistic, and this comparison looks worse for the latter the more data we take into consideration and the larger the number employed for generating the reference distributions. The estimation of the optimal number of clusters within a set of data points is a very important problem, as most clustering algorithms need that parameter as input in order to group the data. Many methods have been proposed to find the proper , among which the approach proposed by Pham et al. in 2004 seems to offer a very straightforward and performant solution. The estimation of the function over the desired range of test values for offers an immediate way of assessing when the cluster-like features appear and allows to choose among a best value and other alternatives. A comparison in performance with the gap statistic method of Tibshirani et al. concludes that the is computationally advantageous. I think this is great. But then, I would. I’d love to understand better how k-means works on real data. These synthetic datasets are good for testing, but they are very low dimensional and very clean. It’s a pretty major challenge to visualize how k-means is doing in 40 dimensions… one thing that happens is the algorithm gets less stable because there are many more directions to slice the same data set into clusters. Have you seen any work explaining or evaluating this phenomenon? You’re totally right. I’m very curious to see how the method works on multi-dimensional, real data. Visualization becomes much trickier though, which is why I chose this simple 2-d case for didactical purposes. I need to find literature in the matter before I dig deeper into practical experiments. Hang in there! i used clustering in analysis of financial services data. it is highly effective to understand the dimensional structure of data as it occurs “naturally”. after a stable solution is obtained, you can use the segmentation for extensive profiling. when building on real data, a lot of time is spent trying to make the sample amenable to clustering. for instance, you need to get set bounds on individual variables so that extreme outliers do not destabilise the solution, or keep it from converging. also, how do you deal with missing data? do you impute? do you exclude altogether? these decisions are subjective, driven primarily by expert knowledge of domain. due to this, clusters built by one analyst are rarely the same as those built by another. check for multicollinearity among variables before going any further. analysts constrain the minimum size of each cluster, e.g., no clusters should be less than 3% of the sample, or some such rule. some analysts may constrain the maximum number of clusters that can be identified. this is to make business strategies manageable/scalable. this will probably be different is biological/engineering industry. since many subjective decisions are involved, quality assessment of a cluster solution is different from that of a regression model. in clusters, you have to spend a lot more time looking at the results to check whether they make intuitive sense, and whether they will help you with your objective. Hello guys, great articles, is it possible to see whole source code with examples in one? I meant if you are sharing this code on github or somewhere else. Hello, it’s just one gal over here, which is why I haven’t had yet time to set up a github repo for all the code. But it’s in the pipeline! Very impressive. If you need additional helping hand with code on github repo, let me know. Good work. The code isn’t running even when applying the changes from Anonymous. A github repo would be really, really great! This code doesn’t run, despite my attempts to aggregate the required code over several posts. If you don’t want to go through the hassle of setting up a repo on git, could you email me the final working code that generated the plots in this post? I can even create the repo for you (and credit you of course!) if you’d like. The lambda expression for ‘a’ in the fK() method is incorrect. All of its variables and constants are integers. Thus it only returns integer values for a. Otherwise, it worked and is a great post! It looks like OP might have ditched this blog, but he/she did a pretty good job with this code and all the work he/she has done to present these complex algorithms in a simplified form. Also, if you’re passing a specific argument to only run one version of the algorithm (gap or f(K) just remember to adjust the graphs in plot_all accordingly as its default is to print both (even as f(K) is much faster). the number of generators cannot be specified. You cannot use this method to find K because you cannot know how many generators there were. They are covering normal methods of finding K.
It can be avoided by implementing this piece of code using Memoization. That way it will store all previous results and therefore there will be no need to compute a(k-1, Nd) again for k’s that has been already computed in previous ‘thisk’ iterations. Great feedback. Right, that’s the problem with implicit functions. The code has been written for clarity without any intend of optimising it. Memoization is a good way to go. Here is a simple implementation I used – is this the kind of thing you had in mind? computation of the weighting value a_k. It is used as a decorator below. recursive nature of the function – see above. Is Nd must bigger than 1? What if Nd == 1? I changed thisk to len(mu) and then it would pop up a KeyError: 1. I need this code in MATLAB or python to MATLAB converter. Any help? I updated the code to Python3 … several more errors than posted above. I am seeing best k = maxk-1 for all maxk I have tried, anyone else seeing that?